California utility regulators seem to have little appetite for San Diego Gas & Electric’s $640 million plan to build a new natural gas pipeline across the county. A draft decision released Wednesday shows how regulators have begun analyzing major new projects through the lens of climate change. In that context, a California Public Utilities Commission judge said SDG&E’s plan makes no sense. The state is trying to reduce the use of natural gas, which is a major contributor to climate change. 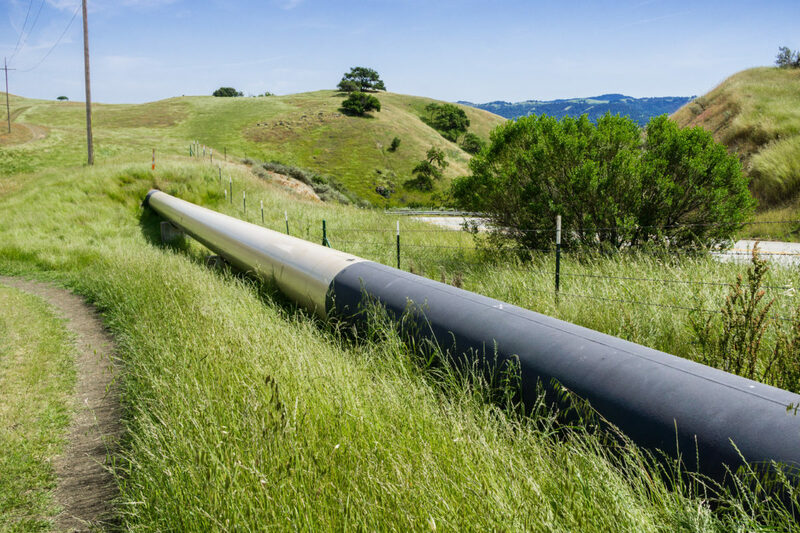 “Applicants have not shown why it is necessary to build a very costly pipeline to substantially increase gas pipeline capacity in an era of declining demand and at a time when the state of California is moving away from fossil fuels,” the decision said. The five-member commission must approve the judge’s draft to make it final. That vote could happen as soon as June 21. In 2015, SDG&E and Southern California Gas Company – two subsidiaries of San Diego-based Sempra Energy – asked the CPUC for permission to build a new 47-mile pipeline. They pitched the line as a rare chance to increase the safety and reliability of the region’s natural gas system. SDG&E argues San Diego is overly dependent on a single major natural gas pipeline and is vulnerable to gas and power outages without a second major line. Gas imported into the region is used by industry, by homeowners with gas stoves and water heaters and by SDG&E itself, which burns natural gas to create electricity. The city of San Diego is pushing SDG&E to ditch gas-fired power, which could cause a dramatic drop in the demand for gas. This week’s decision takes SDG&E to task for a variety of problems with its proposal. The judge, Colette Kersten, concluded the company had proposed using a sledgehammer when a scalpel would do. The existing major gas line to San Diego has only gone down unexpectedly once in 57 years, according to evidence presented to the CPUC. Customers were unaffected by the outage. There is a chance demand for gas could slightly exceed existing pipeline capacity in the next few years. After that, though, demand is expected to fall. In the meantime, Kersten said SDG&E should consider buying space in a pipeline that comes into San Diego from Mexico or building a battery to store electricity. In proposing the battery option, Kersten argued that technology that can store solar and wind power is more practical than infrastructure that carries fossil fuels. “Battery storage now plays an important role in reliability, in line with the commission’s greenhouse gas reduction objectives,” she wrote. If a big new big pipeline were built, SDG&E would have twice as much room in its pipelines as it has demand for gas. That spawned theories over the past few years that SDG&E’s real motive was to use the new pipeline to get gas across the border. Sempra wants to begin exporting gas across the Pacific Ocean from the west coast of Mexico but it needs to get more gas into Mexico to make that work. SDG&E officials have dismissed the Mexico speculation as an unfounded conspiracy theory. Jennifer Ramp, an SDG&E spokeswoman, said the company was disappointed with the ruling. The ruling also spends a lot of time talking about the safety of an existing SDG&E pipeline. New regulations following a deadly 2010 pipeline explosion in the San Francisco Bay Area are why SDG&E said it proposed the new pipeline. SDG&E needs to do one of three things to ensure the safety of a small, older pipeline that brings gas into the region: It needs to test the line to make sure it’s still safe. Or it could replace the line with a new, modern pipeline. Or it could find some way to take the old pipeline out of service. The line currently carries only about 10 percent of the region’s gas. The existing major pipeline carries the rest of the region’s gas. According to SDG&E, the cost to test the pipeline is so high that it might as well just build a new, bigger pipeline – particularly if those tests find the old line needs major repairs. But the company also wants to keep the old pipeline in the ground and send some gas through it at a much lower pressure, something that could reduce the risk of it exploding or the consequences if it did. Kersten said current rules are unclear about whether SDG&E could still use the line, even at a lower pressure, without testing it. So she ordered the CPUC’s Safety Enforcement Division to clarify current rules and also for SDG&E to come up with a plan to test its old pipeline if it plans to keep it in service.